SARK is a writer, encourager, life-coach, creative mentor, quirky delightful thought-provoker, and so much more to the many people who have read her books, participated in her online courses, or done one of the other myriad of things that are available through her website, Planet SARK. I first encountered her when I was dealing with the grief of the impending deaths of my parents, and in searching the shelves of the local bookstore for the sustenance of words, I found her book Glad No Matter What: Transforming Loss and Change into Gift and Opportunity. That book changed so much about my outlook and perspective on the entire grieving process. I am grateful that the book was there when I needed it. This year, I look forward to incorporating another of her books into the continuing process of becoming who I am meant to be, and doing what I am meant to do. 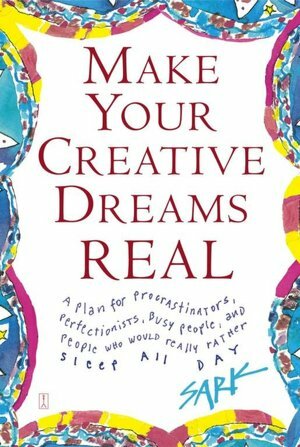 Make Your Creative Dreams Real: A plan for procrastinators, perfectionists, busy people, and people would would really rather sleep all day. Don’t you just love that subtitle? I certainly find myself in that list. In Make Your Creative Dreams Real, SARK seeks to empower the reader to do just that. There is a focus for every month of the year, and tasks for each week of each month. It doesn’t have to be followed rigidly, one can use the book as creatively as one wishes. I’m going to try the linear approach, going through each month’s exercises, but with the awareness that around SARK, the linear approach doesn’t often take a straight line, and can easily lead to swirls and squiggles and stars and explosions of firework-like color. How do you plan to enhance the process of making your creative dreams real this year? Please share in the comments. Comment Challenge — I’m in! I have read a couple of her books and just signed up for the call with her tomorrow. I am seriously thinking of spending the money for her writing course. I believe there is so much more inside of me that gets lost in the day to day need for a paycheck, and my writing gets put in the backseat. The little voice inside me says I am not good enough to be a really good and published author but I have a bigger voice inside of me saying Now is the time to get a move on. Thanks for sharing. Good for you, Terri! Listen to that bigger voice. I’ve participated in a couple of SARK’s calls but haven’t read her books. The first one you mentioned sounds wonderful, and something I could have used when my father passed away. I might get on her call tonight. Some good old-fashioned inspiration is a great way to start the year. Love the new blog, btw! I think you’d still find “Glad No Matter What” to be of worth. Hope you find the call inspiring! And thanks for the comment about the new blog. I’m enjoying the increased capabilities already. I am all over the idea of making my creative dreams real this year! I also try very hard to inspire my children to believe that they can do the same. Good for you, Rebecca! All the best with your creative dreams and your hopes of inspiring your kids as well. Let me know how you progress this year.